Home > News & Events > France > December 1st, 2016: Celebrating PharmaLex expansion with office opening in Paris, France. Thanks to the support of our valued customers and partners PharmaLex has been expanding rapidly worldwide. Since the beginning of December 2016, the new PharmaLex office located in the west of Paris is home to our French affiliate. The new office is headed by Ms. Sophie Guillaume, General Manager PharmaLex France, and Mr. Patrick Larcier, Senior Director Drug Development and Vigilance. To celebrate the opening, we held an evening launch party on the 1st of December. 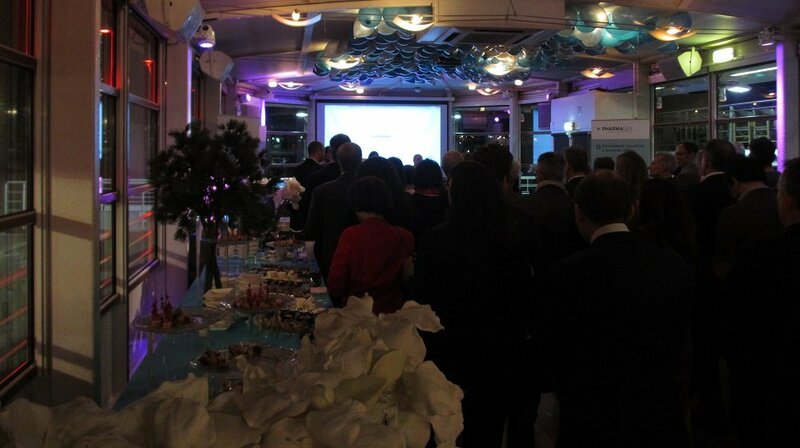 Over 80 guests from the pharmaceutical and biotech industry came along for drinks, canapés and to use the opportunity to find out more on PharmaLex’s global service offerings as well as the Paris office local services. PharmaLex combines local expertise with global reach in the area of development consulting, scientific affairs, regulatory affairs and pharmacovigilance. A proven track record of success in outsourcing programs with more than 25,000 successfully completed projects for over 550 clients worldwide. We offer extensive experience in all therapeutic areas & product groups, including advanced therapy medicinal products & biopharmaceuticals, medical & borderline products as well as alternative therapeutic approaches. It was really nice to see so many of the people that have helped our recent growth efforts and to have the opportunity to chat, socialize and network with current and also new potential customers. We are very proud of how far PharmaLex has come during the last years. The impact our subject matter experts have made in helping companies worldwide in development consulting, regulatory affairs as well as vigilance compliance services has been great. Our new office in France marks the next stage in our development and we look forward to continuing our growth at an even faster rate within our worldwide PharmaLex offices.